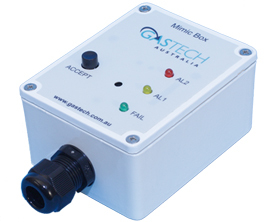 The status of the Fire and Gas panel needs to be quickly and easily assessed from many locations; this can be achieved by using the GasTech Mimic Box in as many locations as required. The Mimic box is hard wired back to the control panel common relay outputs, or an individual channel's relay outputs if needed. If the status of the Fire and Gas panel or the individual channel changes the Mimic box sounder will activate and the associated bright LED will illuminate indicating the cause of the alarm. The sounder on the Mimic Box can be silenced by using the "ACCEPT" Button fitted to the Mimic Box. This will silence the sounder but the will not deactivate the associated LED. If a new alarm is activated on the fire and gas panel the Mimic Box sounder will reactivate alerting the operators of the change of situation. Using the "ACCEPT" button will not reset the fire and gas panel. The LED's will only deactivate once the alarm has cleared from the Fire and Gas panel. 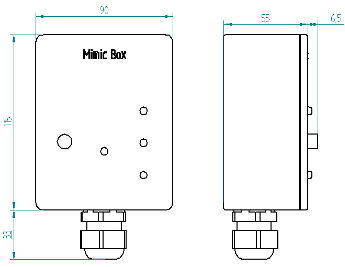 The Mimic Box is designed to be installed indoors. The powder coated diecast aluminium box is designed to protect the electronics in harsh conditions.